Modern (micromotor) PEDI LUX is designed and built in accordance with Directive 93/42 / EEC on medical devices and guarantee quality and safety. The device is designed to treat foot disorders and nails. Moulder (micromotor) has a smooth speed control of up to 30,000 pr. Minut, with possibility to change the right and left directions and replaceable dust filter. 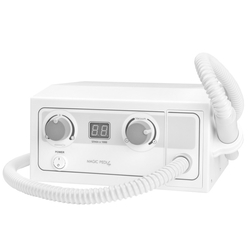 An indispensable advantage of the device is an electronic display that allows you to control the intensity of treatment. Most dust produced during operation is sucked into the turbine or suction cup. Thanks to this design, you will treat as a treatment reducing the gender, such as dust in the lungs, etc.